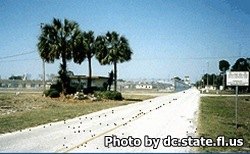 Cross City Correctional Institution is located in Dixie County Florida. It is a level V facility that houses over 1,000 inmates of custody levels that include minimum, medium, and closed custody. It is an all male facility for adults, that offers inmates educational opportunities such as earning a GED, adult basic education and learning to read. This facility participates in the P.R.I.D.E. program allowing inmates to work in a customer service center offering sales support, and digital services. The work camp at this facility allows inmates to work in the surrounding community in various support jobs for the department of transportation, and other contracted interagency work roles. Inmates can also better their own lives by taking advantage of the vocational programs offered, including automotive and collision repair, computer repair and programming, and cabinetmaking. Visiting is on Saturdays and Sundays from 9am-3pm. You may arrive at the facility as early as 7:30am, as registration for visiting begins at 8:15am, and ends at 2pm. If you arrive after 2pm you will not be admitted to visitation. Prior to visiting you must have filled out a visitors application and had it approved.